BerrySki: Real time track overlay with projected future location. Real time track overlay with projected future location. We are pleased to announce that we have added support for real time track overlay as part of Auto Follow mode. Its available for all Android, iOS and Blackberry (QNX based) devices. Continuously update device’s location on the chart. 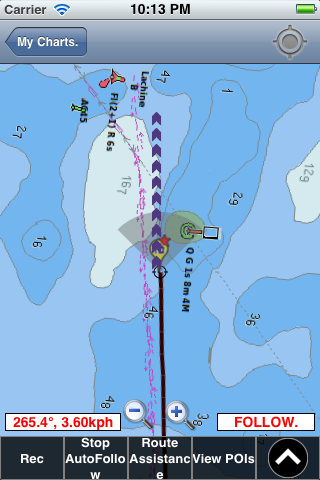 Real time track overlay of the course you have sailed so far. This shows the course you have already sailed in dark red/brown color. This gives you an idea of how you got to your current location. This is helpful to avoid any sailing hazards esp if you are sailing for fun and not following a pre-defined route. Please note that the last two features listed above are in an update that has not yet been approved for some sales channels. The screenshot below shows these in action. The yellow icon at the center is boat’s current location. Dark brown line is the course you’ve taken so far. 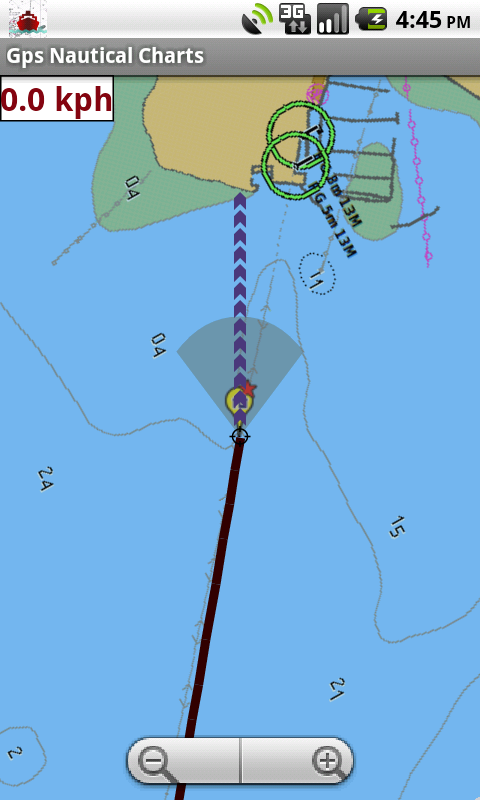 The purple arrow shows where you will get if you stay on the current course.